An Arabic word that forms the first part of many compound proper names of Jews of Arabic-speaking countries. The name following it is invariably that of a deity, and is either (1) the proper name of a god, as in early times, or (2) an adjective expressing some attribute of God which is thus used as a synonym of the Deity. 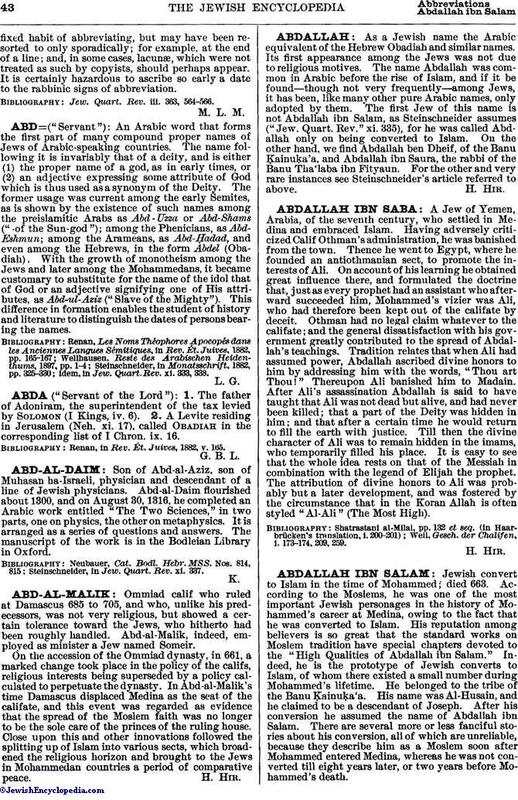 The former usage was current among the early Semites, as is shown by the existence of such names among the preislamitic Arabs as Abd-Uzza or Abd-Shams ("-of the Sun-god"); among the Phenicians, as Abd-Eshmun; among the Arameans, as Abd-Ḥadad, and even among the Hebrews, in the form Abdel (Obadiah). With the growth of monotheism among the Jews and later among the Mohammedans, it became customary to substitute for the name of the idol that of God or an adjective signifying one of His attributes, as Abd-ul-Aziz ("Slave of the Mighty"). This difference in formation enables the student of history and literature to distinguish the dates of persons bearing the names. idem, in Jew. Quart. Rev. xi. 333, 338.